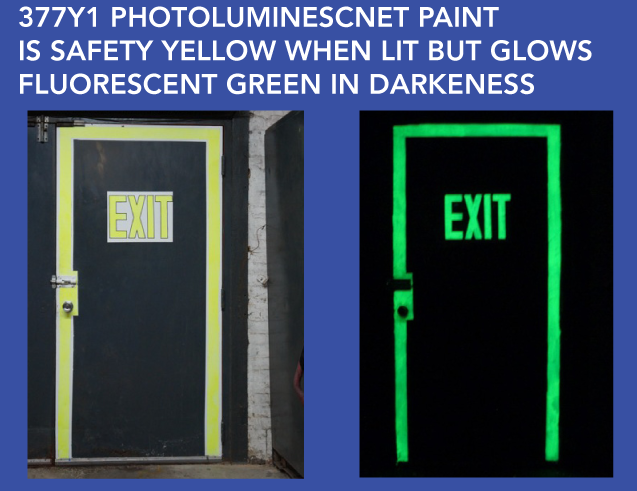 Photoluminescent paints are more expensive than standard architectural paints, but a better value when compared to other lighting options. Carbit’s introductory price for one gallon of No. 377Y1 Water Base Safety Marking paint is $250 per gallon. One gallon will produce 550 lineal feet of a 4” wide stripe. Small samples are available for testing. ¹ “Final Report on the Collapse of the World Trade Center Towers”, NIST, U.S. Depart of Commerce, Chapter 7, p 164.